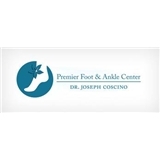 Premier Foot and Ankle Center (Oakbrook Terrace) - Book Appointment Online! Dr. Coscino grew up in the near west suburbs of Chicago, graduated from Fenwick High School with honors and subsequently from Illinois Benedictine University in 1987 with a Bachelor’s of Science in Biology. He continued his education at Scholl College of Podiatric Medicine where he received his doctorate degree in podiatric medicine. He went on to further complete surgical residency training at Midwestern Regional Medical Center. For the past 25 years, Dr. Coscino has been committed to providing quality podiatry care and foot surgery at his Oakbrook Terrace as well as Crest Hill locations. Great office staff and doctor. Would recommend him. Zocdoc made it easy with no stacks of paperwork to fill out at arrival.